Our multipurpose Large storage trolley is supplied complete with 4 large removable coloured plastic storage boxes. 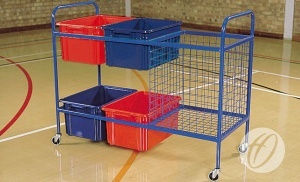 Features integral wire basket storage area. Supplied with four storage containers, but can hold up to a maximum of six.